I was asked if there was a "book" for cancer. If there was not, there is now. 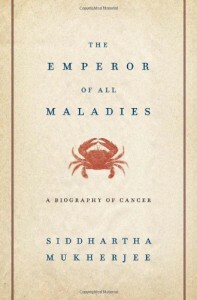 Mukherjee's "The Emperor of all Maladies: A Biography of Cancer" is a ambitious and successful book for which there is not yet a clear ending.Mukherjee is an oncologist and the book does not oversimplify the complexity of cancer. His biography of the cancer focuses on the disease and the people swirling around its vortex. 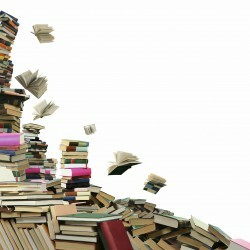 As such, much of the book is filled with scientific language and discussions of experiments and theories. While some of it may be over some readers' heads (and some of it was certainly over mine), Mukherjee always manages to put the discussion into context.As the father of the child with cancer I'm more familiar that I want to be with many of the terms. It was also surprising to see how much treatment occurring today was still be debated in this decade. The story of cancer is long, it is contentious, and it is depressing. But just when you want to give up, another step is made toward battling some type of cancer.One clear lesson is that there will not be a "magic bullet" to solve cancer, because cancer is really many diseases. Some types of cancer have seen progress which may be seen as a cure, but really are simply methods to avoid death. The cancer does not go away, but death is held at bay. For other types of cancer there is slow progress marked by ups and downs as new treatments breed new issues, but other treatments show up in the least expected places.Mukherjee, while clearly respectful of all the people who have made progress in battling cancer, does not glorify his medical profession. He laments the split between researchers and clinicians, the battle of egos which have kept some collaborations apart, the lack of funding from a variety of sources, and the inability of some doctors to understand their patients. However, he avoids the easy target of telling everyone why they are wrong. He shows the scientists in their context, shows how they advance the cause, and celebrates when boundaries are overcome and new hope is created. And how do you end a biography on a living entity? Mukherjee points toward the future of research and where he sees the next strides in overcoming cancer coming from. He notes the progress that has been made and argues against those who say no real progress is being made. You can play with statistics, but when more people live, live longer, and live healthier lives, the statistics no longer matter.This should become a textbook not only for future medical professionals, but philosophers and historians of science as well. And all affected by cancer (and that is nearly everybody) will find that their journey, while unique, is not new. And it is not without hope.